In our press release, we talked a lot about the Magitek Fantasies from the video games of our youth and how they inspired us. Games like Final Fantasy and Arcanum left an indelible mark on us all. As a result, the setting’s appeal brought the team together. The inspiration doesn’t stop there though. Achades was born from the love of many things, some unexpected, some not, but for me, few were more dramatic than Jack Kirby’s Fourth World. I discovered Kirby in high school while working at a comic shop. The owner, Glen, ostensibly the coolest 30 something I had met to that point was a Kirby fanatic and a writer. During my four years at Wall2Wall Comics, he pushed two things on me, the band Rush and Kirby. Neither of them was an easy sell. Geddy had a weird voice that didn’t resemble anything from the Grunge or Metal I was feinding on. 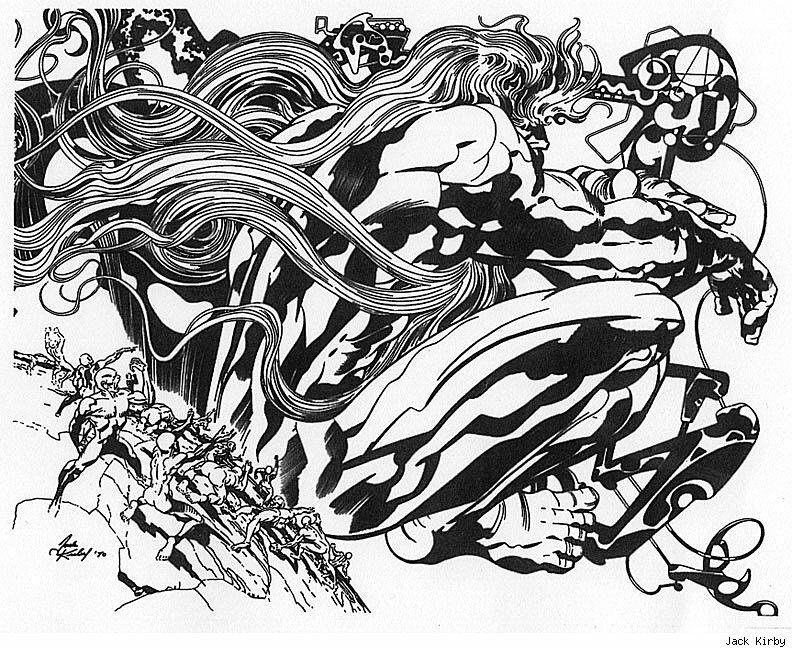 Kirby’s art was an equally acquired taste with its monstrously ugly figures and high-energy. Don’t judge; we were all young once. You have to remember; this was the early nineties. At the height of the Image Comics revolution. I was in the middle of a slow and painful breakup with Marvel. The books I had been reading under Liefeld, Larsen, Sylvestri, and Lee had become lackluster money grabs under Perlmutter, and I refused to keep collecting out of habit. Add to that; Marvel Corporate had become the bad guys, flooding the market with variant covers and clone sagas, driving away the rockstars of the time. As the biggest name in mainstream comics began to lose its dominance over my pull list, creator-owned work became the new hotness. When Phantom Force came out from Image, Glen saw his opportunity and pressed a newsprint collection of the New Gods into my greedy hands. There came a time when the old gods died! The brave died with their cunning! The noble perished, locked in battle with unleashed evil! It was the last day for them! An ancient era passing in fiery holocaust! Inspired, I began to devour his more esoteric works. Finding a taste for the art and its energy, something that stayed with me as I started creating Achades.